The U.S. Army is betting that an innovative system co-invented by Maj. Max Sirkin, ’08, will help save more injured soldiers’ lives. It turns an ordinary military stretcher into a functioning operating table. At a boarding school in Connecticut, just after the 9/11 attacks, Maj. Max Sirkin, ’08, made himself a promise: He would serve his country. He had no idea how he would fulfill it. A few years later and two years into the ROTC program at UR, he had the beginning of the answer when Justin Disher, ’05, of the Spider Battalion pulled him aside. He did. Today Sirkin is a military doctor at Fort Bragg, saving lives one by one on operating tables. But his vision has always been bigger. Off duty, he sits at his kitchen table sketching ideas for inventions that could save thousands of lives. One of them already is: the SHRAIL. 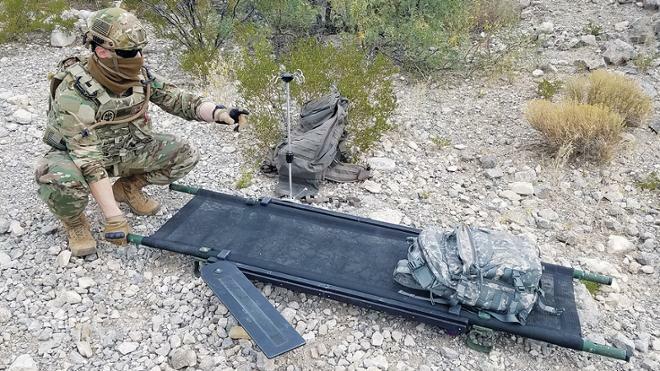 The SHRAIL — or the Sirkin-Hiles Rail System, named for himself and co-inventor Col. Jason Hiles — can dramatically shorten the time it takes to receive life-saving care. When a soldier is injured in the field, it can typically take hours or even days to reach the closest hospital when transporting someone via litter, Sirkin said. A second option, if available, is a portable operating table, which allows field surgeons to operate in remote locations. However, these are antiquated and heavy, Sirkin said, making them difficult to transport in combat zones. Sirkin’s SHRAIL converts any standard NATO litter or stretcher into a highly functional operating table or intensive care unit bed by providing the means to add the side rails commonly found in operating rooms. Surgical tools then can be easily attached to the litter, making more advanced, life-saving procedures possible in combat zones and during transport — greatly modernizing the Army’s current process. “Far-forward surgery” is the Army’s term for it. It has already demonstrated its utility and saved lives. Sirkin and Hiles’ idea went from the kitchen table to an Army team of engineers, patent officers, and attorneys at Fort Detrick in Maryland. They built and tested prototypes, filed patents, and reviewed agreements. Through their work, the SHRAIL concept was refined and only got better. “When the Army saw I had something of value, it jumped in and gave me the best team I have ever worked with,” Sirkin said. After successful testing, the Army signed an agreement with Atlanta-based Morzine Medical to begin manufacturing the SHRAIL. It already has been deployed overseas and, Sirkin said, has demonstrated its utility and saved lives. Deflecting credit, Sirkin frequently stresses his collaboration with Hiles, the SHRAIL’s co-inventor. Sirkin said several more of his ideas for inventions are moving forward, though he can’t disclose information about them yet. They are all part of keeping that promise he made to himself as a boy in boarding school. As the first in his family to go to college, the first to serve in the Army, and the first to become a doctor, Sirkin credits much of his life’s path to Richmond faculty mentors, particularly biology professors Laura Runyen-Janecky, Wade Downey, and John Vaughan. “Those people, they taught me how to think analytically, to work hard," he says. “I would not be here today without them."